Sometimes, I “share” an idea on my Fountain Avenue Kitchen Facebook page. It might be a recipe from another website that I think looks delicious, or perhaps just a helpful hint or novel idea that had never occurred to me. This is one of those shares that I was inspired to try right away. I have a recipe for eggs baked in a baked potato, which I adore. This seemed heavenly, too, and it is. Mash it all together and eat with toast, if desired. I ate one of these alongside a sliced, summer-ripe tomato and some slivered basil and chives. Healthy…delicious…EASY! By the way, it occurred to me that broiling could be a good way to cook the egg more quickly. If I try this, I will report back. If anyone else tries it first, please comment! Baking does cook the avocado to a creamy consistency which I found quite nice. Broiling would, I think, keep the avocado a bit firmer. Scoop enough avocado out to make room for one egg. I just ate that right away. I also made my first hole too small and had a little egg-white overflow. This made me realize that lining the baking pan with foil is a good idea! One large egg is about 1/4 cup, by the way. 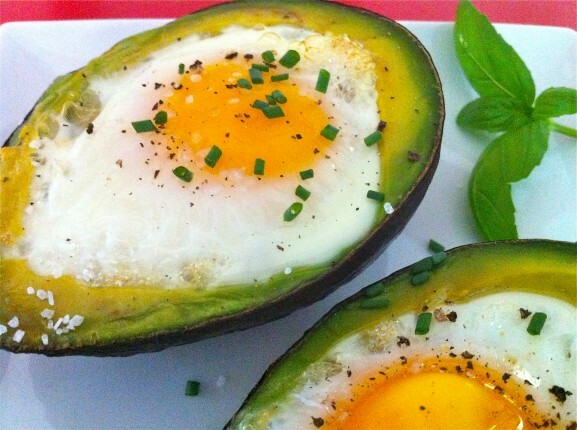 Crack the egg into the avocado and place on a baking sheet or pan (that you have lined with foil or greased for easy cleanup if you spill). Bake for about 20 minutes or until the egg is cooked to the degree of your liking. Check a bit early and watch carefully the last few minutes. Sprinkle with salt and pepper and herbs of choice. I love the simplicity of this recipe and the few, but great whole food ingredients. I bet this is awesome! Can’t wait to try it!! This is the perfect breakfast to me! I love it, Ann!! This is SO up my alley. Gorgeous! Stunning! I definitely want to make this soon! Have a great weekend Ann! New follower. This looks spectacular on a breakfast plate! Thanks for sharing want to try it cold as well! Saw this linked on Ally’s Kitchen and HAD to head over for the recipe… such a great idea! (I’d eat the “scooped out” part right away, too.) 🙂 Thanks for your creativity. One can never get too much avocado, right? Thanks for coming over and for the nice comment! I made something very similar last month, but instead of baking or broiling – stove top. I cut a small opening out of the bottom so the avocado would sit flat and then put it in a small pan. I cracked an egg into it and covered with a lid. Cook/steam it until the egg looks firm. The avocado was creamy and the egg soft-boiled! Great idea! Thank you for the suggestion…perfect as a speedier option! This was so easy, I baked them in the disposable bread pans to cut down on the mess. And the last 5 mins of baking I put cheese, cooked bacon & sliced cherry tomatoes on top. Next time I plan to do cheese & hot sauce on top. Don’t you love it when something so easy is so delicious? I love how you topped the avocados, Trish. Thanks so much for the great suggestions! Looks yummy, and maybe even a little shave of parmesen if you’re having for lunch rather than breakfast. Not sure it would work in the broiler – wouldn’t the yolk get really hard before the white was set? Would be good to hear how you got on. Thanks for sharing. Thank you for the comment, Vonnie. Ultimately, I like the creaminess of the avocado that results from baking so have not even tried to broil them! Adding Parmesan is a perfectly delicious idea! I hope you enjoy! Thanks for sharing this recipe on my Facebook page, it looks devine! I would love to have you link up with my Clever Chicks Blog Hop this week! DO NOT broil. Done on outside but not on the inside and I broiled on low. Thanks for taking the time to leave the helpful comment, Debbie! You are making me hungry all over again, Jen! Your version sounds delightful! Once the flesh of the avocado comes into contact with the air, it will slowly begin to discolor. To slow this process, I store any leftover wrapped with plastic wrap directly touching the surface. I do this with things like guacamole, too. Hope this helps! I hope you love them, Nettie…and enjoy all those avocados!